And so it begins, this delicious game of peekaboo into other people’s spaces. If you want to know what led to this, or how you can be a part of it, read the post before this. Without further ado, here’s Allan Jay’s writing space. Many thanks and kudos for braving first spot. “This is where I write. There are four important things to note about this picture. 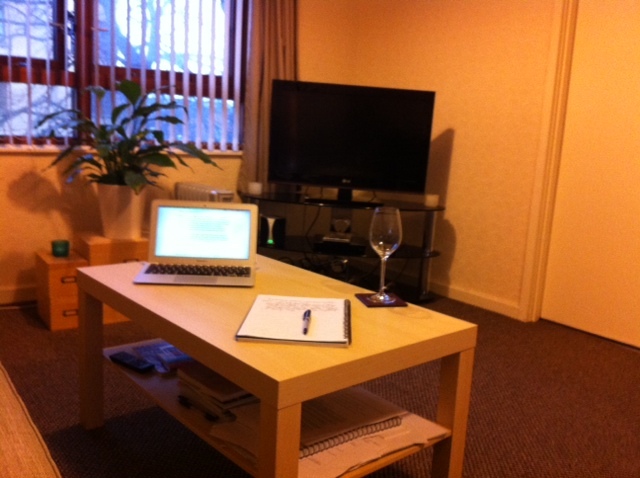 First, this is my cheap coffee table in front of my lovely luxurious sofa. It’s important for me to try to get things in the right order. That’s why I spent hundreds of pounds on a sofa so comfortable I actually want to spend my evenings on it and under twenty for a table for resting mugs and glasses on. I don’t sit on the table. But I do sit on the sofa, usually cross-legged, usually in front of that laptop. I do have a desk but I don’t use it. The main benefit of not having a partner, children or cats is that I can write out in the open and not get disturbed. The drawback is of course that I worry that the lack of those things makes me too unusual to be a proper M/M romance writer. Second are the tools themselves. I always start by jotting ideas and plans down in notebooks. I have many, many notebooks. I love notebooks. If there is such a thing as a non-sexual fetish, then mine is for those. I do my first draft and expand on my notes in an App called Typed (on screen in the photo), then copy it all into Scrivener for organising and editing – the MacBookAir is a wonderful piece of kit for all of this. I’ve worked through about 20,000 words of the novel I’m working on in this way and its working quite well for me. So far. Third is the little green light you can see in the background. The television above it is rarely on. In fact I’ve watched about three hours of live television this month. I’m much more about audio. The green light is a bluetooth speaker and I switch between radio and music almost all evening, every evening. For writing I prefer music without lyrics. I have a large collection of Cafe Del Mar compilations that works just great for me. Spotify is also quite handy for this kind of music should you need non-intrusive background music to write to. Allan Jay writes M/M romance. He’s had a couple of short stories published and is currently working on his first novel. You can follow him on Twitter – he’s always got it switched on – @allanjaywrites for the writerly things or @allanj69 for the everyday things. He’s also, reluctantly, on Facebook. He needs a kick up the backside to get writing from time to time, so go prompt him. This entry was posted in Uncategorized and tagged workspace wednesdays. Bookmark the permalink.